We often forget the power of the Smartphone and just how helpful they can be. Being self-employed can make it hard to keep on top of all the to-do’s and what not to do’s whilst keeping up the appearances of your brand. 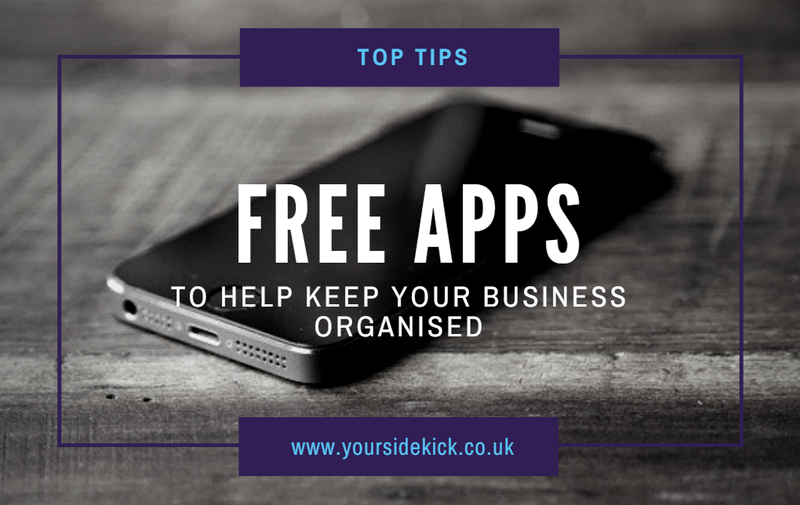 To give you a helping hand, we’ve selected some of the best free apps available for you to download to keep up to date on many of your businesses needs on the surface of one just gadget. Reminders- It does exactly what it says on the tin. Whether it is an appointment with a client or a reminder to take a breath on a busy day at work, this pre-downloaded iPhone stock app will ensure you stay aware of all your most important tasks and won’t let you forget them until they are completed. You can organise your reminders into different categories to keep your work and personal life separate, create lists in order of completion date or simply create a day-by-day to-do list to make a schedule that works best for you. You can even sync your reminders across all your devices to ensure you never miss a task. More advanced settings on the Reminders App allows you to create a ‘location-based reminder’, sending you a notification of a particular task upon arrival of a specific location you have pre-set. Great for those who run errands on the go and need a gentle reminder of whatever it may be, wherever you may be. Trello- For those with an Android phone do not fear! We have just the app for you to keep all your tasks in one place no matter how big or small. You can create categorised lists and scheduled reminders whilst setting due dates to ensure completion to keep you on top of all your most important tasks. Trello is great as a place to keep any important nuggets of information you might want to use but haven’t quite found the right place for it yet. Share your ideas with others and invite clients to view your ‘boards’ by making areas of your account ‘public’ or keep your most important reminders and ideas private where only you can have access. A great app for any Smartphone user who is looking for a place to store any type of information, no matter what it might be. Wallet- One of the most overlooked stock Apps on our phone, Wallet allows us to keep more than we think in one simple location. Whether it be boarding passes for those of you that travel with work or a store loyalty card or coupon, the Wallet App keeps anything with a bar code in an easily accessible place to open at any given time. Credit cards, tickets, restaurant vouchers and much more can be kept here and cut out any need for printing and paperwork and can be found in one slick and smart setting, which looks great at business lunches with important clients. Buffer- Being self-employed can make it hard to ensure the business social media accounts are regularly up to date, making it difficult to ensure your consumers feel connected with you brand. Luckily, social media management platform, Buffer, is a great way to pre-schedule any social media posts to make sure your feed is always live and keeping your consumers in the loop. Whether it be appointed on a weekly or daily basis, you can ensure all your platforms are taken care of from one dashboard and can be left to update themselves whilst you maintain all other aspects of your business. Canva- For all your marketing needs, Canva is a free graphic design tool for business professionals and is great for those needing a leg up into the world of graphics. It ensures your business not only looks good but maintains a coherent appearance throughout all your different platforms and social media sights by allowing you to create your own designs and templates and by store all your used fonts and colours in one place for you to use again and again. FreeAgent- Voted the UK’s number 1 accounting software for small businesses, FreeAgent allows you take care of all your business needs, anywhere. Whether it be expenses, invoices, taxes or cash flow, this handy app allows you to work closely with your accountant and cuts out any need to send over spreadsheets and instead work directly from the same set of books from your own device. Its an accounting app that will revolutionise the way you manage your business. Oh, and did we mention its completely free as part of our service at SideKick? Sign up now to find out more.